Royal Doultons George Tinworth was their most important designer of decorative vases, jugs and humorous figures and animals. George Tinworth (1843 – 1913), was born in Walworth in 1843 the son of a wheelwright. George was supposed to work with his father but he liked to spend his time carving bits of wood. George Tinworth’s talent as a modeller and potter were recognised by J. C. L. Sparkes, the headmaster at Lambeth School of Art, where Tinworth, having pawned his overcoat to pay for his fees, studied pottery. After Tinworth’s father died, and he was struggling to support himself and his mother, Sparkes persuaded his friend Henry Doulton to employ Tinworth to decorate pottery. He eventually became their most important designer of decorative vases, jugs and humorous figures and animals. He continued with his own work too and his pottery reliefs of Biblical scenes exhibited at the Royal Academy were especially famous and were admired by John Ruskin. As a major influence in the Royal Doulton world in the late 1800’s and early 1900’s, he designed and manufactured a wide range of mice figures in all sorts of scenes. The piece pictured was modelled in the mid 1880’s and is considered very rare and collectible. 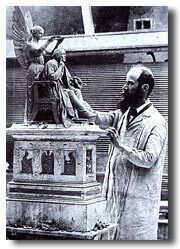 The 1893 Chicago Exhibition is widely regarded as the pinnacle of the success and achievement of Henry Doulton and the Doulton Lambeth Art Pottery with some of the most outstanding pieces ever made by the pottery being sent to the exhibition. The breadth and quality of wares exhibited, which included 1500 pieces, made a significant impact at the fair with numerous favorable reports from the world’s press. And George Tinworth rose to be recognized as the most notable artist of the early period and the most comprehensively represented artist. The History of England vase (52 5/8 inches and dated 1872, est. $80000 to $120000) is one of only two thought to have been made. This was normal practice in the pottery industry due to the unpredictable nature of making and successfully firing of large one-off pieces. The vase is constructed in three sections and modeled with repeated vertical scrolling foliage on the lower part of the body and above has horizontal bands of repeated over-lapping leaf bands either side of two figurative bands. The upper figurative band consists of twenty figures of British rulers applied into arched niches separated by Ionic columns, each with incised names below them. In the central band around the waist are twenty larger figural scenes depicting various significant events in British history, each scene within an arch between double Doric columns, with incised oval panels above. In contrast to this magnificent piece, it is George Tinworth’s most endearing and smallest works that are eagerly highly sought after by collectors. Particularly the humorous mice and frog groups, including: a chess set modeled as mice dressed in medieval costumes (est. $8000 to $12000), and The Cockneys at Brighton; another humorous mouse group (est. $1800 to $2500). The various illustrations shown below are examples of George Tinworths fine work featuring his favourite subjects, mice and one off studies that are very rare indeed. His jokey "humoresques" as he called them, that show animals in human situations was his way of finding light relief. Consequently, they were produced in small numbers and without documentation except for Tinworth’s easily identified ‘GT’ monogram which many of them bear. Today they often make staggering prices at auction. He modelled mice either singly as paperweights and chessmen, or in groups that tell a story. 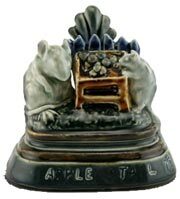 For example, a menu holder, first produced at Doulton in 1885 is designed as an apple stall with the mouse attendant asleep while another quietly steals an apple. In Tea Time Scandal a mouse tea party is in progress, while Menagerie is a clock case featuring 19 mice all engaged in various circus pursuits including a wheel of fortune and a shooting gallery. Another shows mice in a rowing boat, made by Tinworth in about 1885 and called ‘Cockneys at Brighton’. While one mouse rows, another plays a concertina, much to the amusement of the young mice in the prow and the dolphin following alongside. George Tinworth Collectables … they are not easy to find and rarely come to the saleroom, but if you ever come across one you should snap it up. 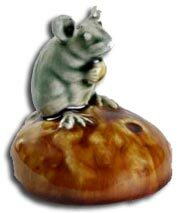 Particularly Tinworth mice groups, which will only increase in value as more Doulton collectors come to appreciate how good they are.